Extra 5% off R8000 group sets this Week Save an extra at the checkout. The latest evolution of Shimano Ultegra, the R8000, has arrived. As well as a host of developments which improve user ergonomics, the R8000 Groupset includes subtle tweaks to adapt to current trends and ensure compatability with the wide spectrum of riders and bikes today. The Ultegra R8000 components share aesthetics with Dura Ace 9100, the technology has trickled down too, albeit at a much more cost effective price point. Outstanding! I've owned many previous models of Ultegra but none were as good as this one. 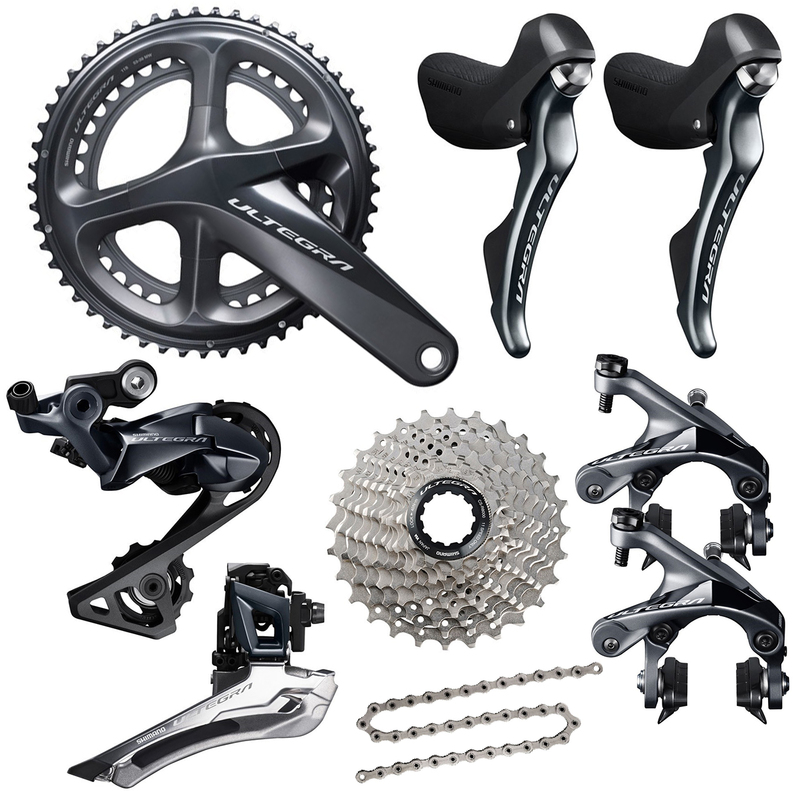 Shimano has truly raised the bar so high that it would be hard for any other manufacturer to match the shift quality and beauty of this groupset at this price. Fitted this with a 52/36 crankset and 11-34 cassette for an old Shimano 10-speed wheelset. The shifters and derailleurs didn't even blink at the massive range asked of them, and shifting is crisp, quick and satisfyingly positive up and down the block, whether in the big or small chainring. A few gaps in the cassette with that range, inevitably, but easy enough to deal with for the sake of not having to buy a new wheelset as well as the gruppo. As an upgrade from 5600-series 105 and Tektro brakes, this was a revelation. The front derailleur is the stand-out component and switching chainrings is now as easy and effortless as shifting cogs. The brakes have wonderful feel and modulation, once you're used to the massive stopping power. It's a little more finicky to set up and get properly humming than previous Shimano group sets but once it's just right it's flawless. The shifters are lovely and comfortable, and the adjustable range for the brake lever reach is handy. Not sure how much I notice the textured rubber on the hoods through a pair of mitts, though. Definitely worth it at full price. Even more worth it for the deals Merlin offers. And it looks very, very pretty. Love this new group and the gearing option. The 52/36 and 11-34 are perfect for the steep hills where I live. I am just coming back from open heart surgery and this combination doesn't leave me in wanting even on an 8% grade. Love it. Had a 10 speed Campagnolo groupset. I wanted an 11 speed so I could get a 11/32 cassette. I was concerned about leaving Campagnolo but the Ultegra 8000 groupset works great. Extremely smooth shifting. Solid Solid groupset. Put about 200 miles on and it feels great and smooth. Keep in mind that the groupset comes with gear and brake cables and that a set is not necessary. Merlin had the best price on the groupset and fast shipment to U.S. Overall, it was easy to install the groupset but rear derailleur took a little extra time to find tune due to difficulty with the barrel adjuster. Significant improvement in shifting compared to Ultegra 6700 10 speed. Very crisp and accurate. The use of 11-30 cassette with short cage derailleur is a big plus in my opinion without having to go with mid/long cage. Very happy with the upgrade! Great new group-set - looks great on the bike! Shifts as stops as well as 6800, but no better or worse from what I can tell so far. Watched some YouTube videos on how to install the front mech, requires a longer chain for me than 6800 using the short cage and used the B screw to tighten the chain slack out. Italian bottom bracket requires a tool, I didn't have and an adapter is not included. Brake wires are easier to install. Also be careful not to stretch the hoods and leave them on the lever for the install, just peel them back. Brake clearance for 700 by 28, short cage will support a 30 tooth cassettes, and grippy hoods, and improved darker color, are the biggest upgrades. Cheapest on the internet, and next day delivery. No instructions included so check out YouTube or download the instructions in advance, as some of the cable routing, particularly the front mech, is slightly different to past versions. Gone with 11-30 cassette and the intermediate chainrings (46/52), feels more natural than the compact double and spending less time in the 11, I don't spin out on slight descents as I did before with the compact double. Shifting is much slicker than the Sram Red 10 speed I replaced but one week later and I'm still fine tuning as downshifting is sometimes slightly slow - feels more gentle and refined than the aggressive shifting of the Sram. Less effort is needed to perform shifting than with any 10 or 11 speed groupset I've used before. The new front and rear derailleur updates are very nice. Love the color scheme. Had no issues with install. Highly recommended! Everything looks good and what you'd expect from Shimano. This is part of a total rebuild of my main road bike. Note, there is no adaptor tool supplied for the BB so you will have to order one separately if you don't have one already. Also, and this is no issue either, installation manuals can be downloaded in pdf form from Shimano's website. You need the dealer manual. 50/34 Chain rings, 11-32 Cassette replacing a 105 triple groupset. The step up to Ultegra is a complete step change in shifting, responsiveness and speed of change. The package came with all the necessary cables and sleeves, I downloaded the dealer manuals to give me a better understanding of the fitting. Covered 5-600 kms so far with no problems and very happy with the purchase. Delivery and boxing of the kit were first class (DHL to NZ) so no hideous customs clearance charges from NZ post. I have been using this R8000 group for only about 250 kms so very early days yet. I found it a bit of a fiddle to get the tuning right re: front chain rub in the big ring. The lever throw is a bit less than the 6800 and less effort. The brakes are super good, great stopping power with nice modulation. All in all a good looking groupset with some nice upgrades from the 6800. Would recommend.